I figured my readers deserved an update on my brother since a lot of them read about my worries last week when my brother ended up in A&E with a lung infection and suspected Lupus last Saturday. Once he was home I carried on worrying about him and checking up on him regularly. I told him off for walking to town and ordered him to wear extra layers when he had no choice but to go (WE NEED A CAR!) for electric. Luckily by the 3rd day of antibiotics he was beginning so breathe easier and walk a little further but still felt very drained. I went to see him and check he was really Ok on Friday and was so pleased to see he was looking and sounding a bit healthier! I dragged him out for some lunch before we went on our mission. We have been trying to register him at a GP for well over a year but each one wants his previous GP address which he honestly can’t remember. His social worker gave him the wrong address in the Summer when she signed him off so we were a little stuck. With a whole heap of other stuff going on it was something we kept forgetting to chase up again. 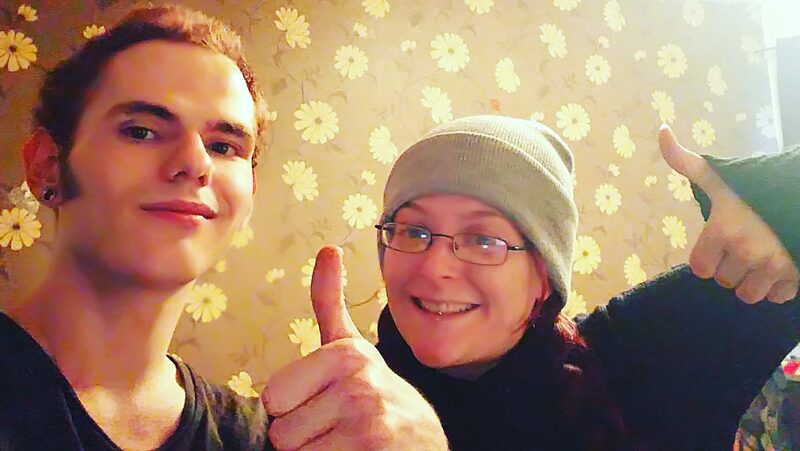 Having been told in A&E they suspected Alex has Lupus and he urgently needed to get a referral to a Dermatologist it was the kick up the arse we both needed to finally get it done. Alex mentioned in A&E he has been struggling to get registered with a GP so they gave him his NHS number.. at last! So on Friday our main mission was to get him registered and we FINALLY managed it! It’s literally just across the road from him and open later than most which is perfect for him. We both walled out of that surgery high-fiving each other and cheering! At last mission successful!! He has to call back Wednesday to ensure he’s added to the system properly. After that he will be booked in for a new patient check. Then he can book an appointment with a GP and get a referral to dermatology. It will take a few weeks but he’s literally been without a GP for years now so a few weeks aren’t too sad! When we got back to Alex’s I showed him my previous post, I admitted he’s mentioned a fair bit on my blog but nothing too personal which he didn’t mind at all and the photo’s of us he absolutely loved! Especially when I explained why I chose the ones I did. He decided we needed to start taking more of us together, another little tradition to add to the list, so I thought I’d share them with you all! We chatted as we usually do about our past, the present and the future. It was lovely to see he is finally feeling positive and making plans. He’s come such a long way over the last year! A lot has gone on that I haven’t mentioned because I believe that’s his personal business but I am so proud of him! He is coping so much better, he realises now he is far from dumb although he struggles with things. He realises now it’s due to not being taught the basics. Things like how to clean, how to cash a cheque etc. have always been stressful for him. He asks for help when he needs it instead of just getting frustrated with himself now. It’s lovely to see! The last week he’s felt very depressed but he’s dealt with it well, popping to his neighbours for a chat & inviting a few friends round. Normally he would shut himself away and end up feeling a lot worse. I’m so proud to hear he had realised he felt low and did something about it before it got worse. Alex suggested writing a review of the Alarm for me which I think is a brilliant idea. It would be great for other’s to see how he gets on and what a difference it makes. Maybe it will help someone else out too! So keep an eye out for his guest post at some point over the next month or so. Since his stay in hospital he’s waking up early and has been waking before the alarm starts. So hasn’t had a chance to test it out yet. Typical 😉 haha! All in all Alex is doing much better, his lung infection seems to have cleared up well. Thank you for all the support I’ve had from my readers. It’s been lovely to get comments checking how he’s doing and suggestions to help him. I’ve been worrying about my baby brother over the weekend. Most of you will know from some of my posts and tweets Alex is a big part of my life so to get a panicky call from him on Saturday and hearing him seriously struggling to breath left me worrying, A LOT. As well as struggling to breath he’s had these strange ring rashes appear which look very much like Lupus. Alex had tried and struggled to go to his nearest shop and rung me worried, he didn’t want to walk to the hospital ‘in case it was a waste of time’. He suggested waiting until the morning.. So I put my Mummy voice on and insisted at the very least he call 111 for some advice. As soon as I put my phone down I began to panic, Alex doesn’t have the greatest immune system and has weak lungs from being born prematurely, he also suffers from Asthma. Temperatures were below 0 and I was worried he would get worse but luckily he did what he was told and called 111. An ambulance was sent out to him and the paramedics decided he needed to go to hospital. His heart rate and irregular breathing was concerning them so they insisted he was wheeled to the ambulance instead of walking which he wasn’t too impressed with. He text me to let me know he was waiting for the ambulance then understandably I didn’t hear from him for over an hour. I spent the entire time unable to concentrate on anything, constantly checking my phone for an update. Eventually Alex let me know he had bloods taken and had ‘things put all over his chest’ (ECG) and he was scared. I tried to distract him whilst he waited, chatting about a documentary I was watching on the London Graveyard’s by London Liverpool Street Station. After some rambling back and forth he eventually got his results. It turned out Alex has a lung infection and suspected Lupus. He called me as he walked home, struggling to breathe. Hearing him so vulnerable, crying from the pain, being so scared alone was horrible, I just wanted to be there and give him a hug. He was given antibiotics for the lung infection and his NHS number (At last!!!!) so he can finally register with a GP and get a referral to a dermatologist to confirm the suspected lupus. The two major symptoms are joint and muscle pain and an extreme tiredness that won’t go away no matter how much you rest. Noticeably, whilst the two major symptoms are invariably present, people with lupus can differ greatly in their symptoms and how the illness can affect them – life-threatening for a few, very mild for some. We are all extremely worried about his health, he has had all the symptoms that point to lupus for a while now. This worried me just as much as the lung infection. He is my baby brother and I hate that I couldn’t be there with him. Not having a car is becoming more and more stressful, things like this happen and I’m left helplessly worrying instead of being there to look after him. I’ve always tried to look out for my baby brother, I remember holding his tiny little hand through the incubator for the first time. He was so tiny and fragile and spent a long time in NICU so when he finally came home I couldn’t leave him alone. I fed him & changed him as a baby, I taught him his first words, how to read and write. He learnt his first colours from a song I made up with a row of coloured teddies over his bouncer. Red teddy, yellow teddy, green teddy, blue! He may be my baby brother but I guess in a way he’s always been my baby too which is why I’m so protective of him. To me he’s just like the girls, he’s a huge part of my world and I always feel the need to care for him so times like this are extremely tough. 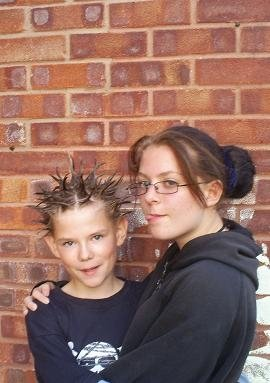 Alex and I had an unusual childhood, he was in care from 7/8 years old but this has never stopped us having a strong relationship. We have only lost contact once for a few months when I left home and went into a women’s refuge, I didn’t have any contact details for him but eventually we sorted it and contact resumed. When I had Eva he had been sectioned and was in hospital after several suicide attempts. I knew I had to jump in some how and bring some normality back to his life so I arranged home visits, had visits from Social services etc. to ensure our flat was safe for him. Since then we have kept in regular contact and gone through a lot together, I know he almost see’s me as a mum to him too and with him not talking to ‘her’ right now means I am pretty much all he has, knowing that and not being there was so difficult. We were brought up to avoid Dr’s and Hospital’s, terrified that anything and everything would end in needles.. no wonder I had a needle phobia! Knowing he was sat in the same A&E room where he sat as a child being told off for having a broken leg worried me, he’s also overdosed several times and ended up there too. He suffers from PTSD and I was terrified this would set him off but distracting him did seem to help. I’m hoping the antibiotics help and his lung infection goes away. I’ll be focusing on getting over to him as much as I possibly can over the next few weeks to help get him registered at a GP. We also need to get his referral for a dermatologist to find out if he does have Lupus and what we can do to keep him as healthy as possible. Lupus is extremely complicated and Alex is understandably terrified as he has no clue what’s going on. He’s had so many of the symptoms that it really is worrying but I intend to look after my baby brother as much as possible! Have you ever been in a similar situation? Do you know anything about Lupus that may help? Please do leave a comment if you have any experience with Lupus.